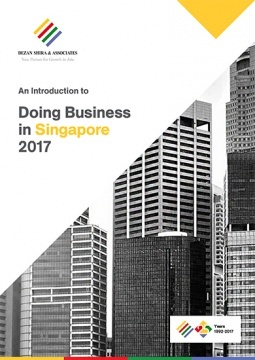 An Introduction to Doing Business in Singapore 2017 provides readers with an overview of the fundamentals of investing and conducting business in Singapore and outlines the city’s role as a trading hub within ASEAN. The guide explains the basics of company establishment, annual compliance, taxation, human resources, and social insurance in the city-state. A detailed examination of the role of Singapore’s many double tax treaties and its position within the ASEAN free trade area plus its relationship with China and India are also covered. An Introduction to Doing Business in Singapore 2017 provides readers with an overview of the fundamentals of investing and conducting business in Singapore and its role as a trading hub within ASEAN. The guide explains the basics of company establishment, annual compliance, taxation, human resources, and social insurance in the city-state. A detailed examination of the role of Singapore’s many double tax treaties and its position within the ASEAN free trade area plus its relationship with China and India are also covered. As the Association of Southeast Asian Nations (ASEAN) continues upon its path towards closer economic integration in 2017, Singapore’s role as the de facto financial and commercial capital of Southeast Asia will be unassailable. Having already established its competitive niche as a destination for establishing regional headquarters, branch offices and holding companies in Asia, Singapore’s legal and tax regimes continue to be among the most business-friendly in the world. Offering foreign investors access to a highly skilled workforce, English-speaking business environment, immense logistics and transportation capacities, and over 70 double taxation avoidance agreements (DTAs), Singapore has firmly established its role as the gateway to ASEAN, China, India, and the whole of emerging Asia for foreign investors. The content of this guide was compiled by Dezan Shira & Associates staff in Singapore, providing corporate establishment, business advisory, tax advisory and compliance, accounting, payroll, due diligence and financial review services to foreign investors in emerging Asia.